Leaves are on the ground. The days are shorter. Artists are busy in their studios, finalizing a selection of new! interesting! amazing! beautiful! necessary! artwork. Pick up your brochure today—or download it from the website (CLICK HERE! 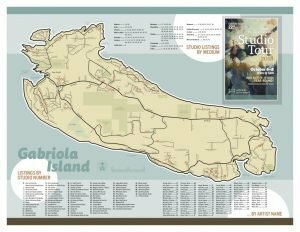 )—and start planning your route around the Island. You’ll have to be especially strategic this year—there are more studios and more artists than ever before. Need help making your decisions? Stop by TOUR CENTRAL at the Gabriola Arts & Heritage Centre—that’s 476 South Road, beside the Post Office—and see an example of work from almost every artist on the Tour. Speaking of Tour Central (CLICK HERE and scroll down for details) … don’t forget the Tour Launch Party on Thursday, October 4. Artists and art-lovers will be gathered to celebrate the work that’s been done, and the fun that’s ahead over the next few days of art-touring. Come on out to take in the exhibit, and congratulate artists on the work they’ve completed. It’s the perfect way to begin the Thanksgiving weekend. Hey Tour Artists! Don’t forget— FREE hand massages for you at the Launch Party! CLICK on the map below to see a full-size Tour map, or to download one for easy reference.